The phone was ringing when I returned from a walk on that sunny day. It was my Dad, weeping as he told me about the first tower falling. We didn't have a television so I ran to my neighbor's and watched in horror as the second tower fell. Later that day, like so many of us, I sought solace during a prayer vigil at church. 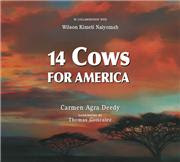 As we remember how we longed for comfort and community eight years ago, I'd like to offer my Fire Escape visitors the gift of 14 COWS FOR AMERICA, a new picture book by Carmen Agra Deedy and Wilson Kimeli Naiyomah. 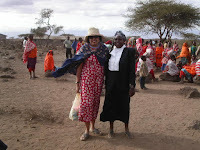 I've experienced the hospitality of the Maasai people firsthand (that's me to the left in the photo), so this book is especially dear.